Dermaplaning is not facial shaving, but it is. Shaving is defined as “cutting the hair off one’s face with a razor.” Dermaplaning uses a scalpel blade, not a razor, but it does cut the hair off the face. Dermaplaning works in similar fashion to at-home razors but is significantly more aggressive. Both the blade and razors are placed at a 45-degree angle to achieve optimum results with a minimal result in injury (you may experience the occasional nick). Dermaplaning is more aggressive than shaving. 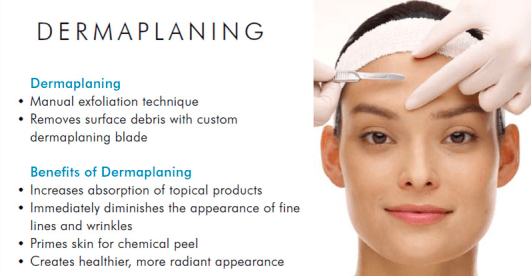 Dermaplaning uses a surgical, disposable blade. Dermaplaning cannot be performed at home. Dermaplaning blades are singular, whereas razors are usually stacked with 2-3 blades. Dermaplaning is a skin rejuvenation treatment intended to remove dead skin cells and improve fine lines, wrinkles, and improve skin tone and texture. Dermaplaning should not be used to get rid of terminal hair (such as beard hair). Dermaplaning should not be received any sooner than 21 days apart. Let’s now discuss the benefits so you may understand why the industry is abuzz over this service. Did you know Marilyn Monroe regularly shaved her face? Ask any skin care professional (or Hollywood actress) what the secret to flawless, youthful skin is, and they’ll tell you it’s exfoliation. Dermaplaning is one of the best methods of exfoliation that has zero downtime – a major plus. Some clients experience mild erythema (superficial reddening of the skin), but it subsides quickly. Besides that, and the radiant skin recently achieved, no one would ever know a service was rendered. Eliminates vellus hair and dead skin cells. Increases product absorption and efficacy (products work better). Makeup application is smooth and flawless. Brightens skin and reduces hyperpigmentation. Great alternative for those with sensitive skin or rosacea.